Tagged under Shingeki no Kyojin, Brown Hair, Husbando, Short Hair. The main protagonist of the series, Eren starts off as extremely idealistic and obsessed with the idea of adventuring outside the walls. After the wall protecting Shiganshina is finally breached by Titans and he witnesses the ensuing slaughter and the death of his own mother, Eren is consumed by revenge and vows to exterminate all Titans. 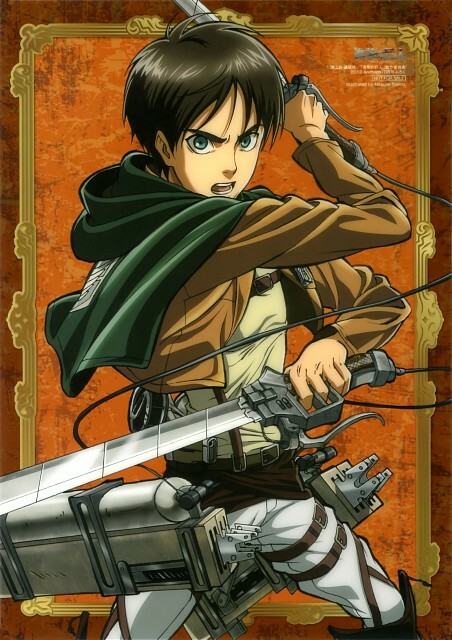 After the survivors are taken to another town, Eren trains hard and is accepted into the Survey Corps, the branch of the military responsible for expeditions outside the city and battling the Titans. At one point, instructor Keith Shadis remarks that while not having any particularly impressive abilities like the other recruits, Eren makes up for it in effort. He gets along well with his adoptive sister Mikasa Ackerman and childhood friend Armin Arlert.